Fisheries and aquaculture should be environmentally, economically, and socially sustainable, perpetually ensuring healthy food, as well as the welfare of fishing communities. The application of the Code of Conduct for Responsible Fisheries leads to the Ecosystem Approach to Fisheries (EAF), which entails risk based management plans. This process covers the principles of sustainable development, mainly considering ecological and environmental parameters, while also including human and social aspects. According to the FAO, the purpose of an ecosystem approach to fisheries is to plan, develop, and manage fisheries in a manner that addresses the multiple needs and desires of societies, without jeopardizing the options for future generations to benefit from the full range of goods and services provided by marine ecosystems. In practice, the Ecosystem Approach to Fisheries ensures partnerships and defines priorities, using a precautionary approach first and an adaptive one later; thus, it leads to the best possible decisions based on existing data. 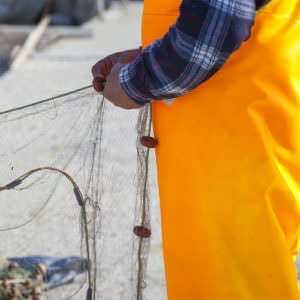 The majority of fish stocks in the Mediterranean are in poor condition. Urgent measures are required, therefore, in order to restore stocks to a healthy status. Furthermore, it is immediately required ecosystem approaches in order to as far as possible these fish stock to be recovered. In iSea we recognize the value of fisheries for Greece, so our target is to collaborate with scientific institutions and contribute to reinforcing public opinion on the need to take appropriate measures. Sharks and rays have been present on earth for nearly half a billion years, with more than 1,250 extant species. The pivotal importance of cartilaginous fish for marine ecosystems is highlighted by the fact that most shark and some ray species constitute top predators, thus possess central and stabilizing functions in marine food webs. 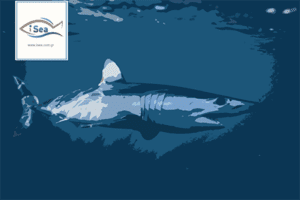 Our work aims to monitor the landings and the marketed products of elasmobranchs in the four major ports of the North Aegean Sea, which is considered a hotspot for elasmobranchs in the Greek waters. The aim of the project is to study and mitigate the impacts of bycatch and ghostfishing on the sea turtle and shark populations in Greece, through awareness, capacity building and cooperation with stakeholders in the fisheries sector. Fisheries certifications are a relatively new practice that is used as a protective management strategy for sustainable exploitation of fish stocks and natural resources, thus ensuring long-term access to fish for future generations. Essentially, the power is transferred to the consumer, when consumers choose certified products it encourages environmentally friendly practices that have minimal impact on marine ecosystems. Certified products are labelled with eco-labels (tags) on their packaging that indicates the product has been produced with good practices, while ensuring the consumer the origin of the product consumed.